Whether for good or bad, the Oscars have, over the last few years, become super political. What used to be a few jokes, a few reaction shots, a few fashion flaws, and gush talk about movies that people claim to have seen but really haven’t, has now become almost political theater, with issues of representation, racism, colonialism, police brutality, sexism, harassment, front and center in glittering marquee lights. Some may say that by moving away from being an anodyne apolitical platform, the Oscars have somehow recaptured its relevance, its mind space, that the Oscars are water cooler talk again, even by people who have never seen or will see the Shape of Water, a love story of a human and a fish, one you can see for free at any Bengali lunch. 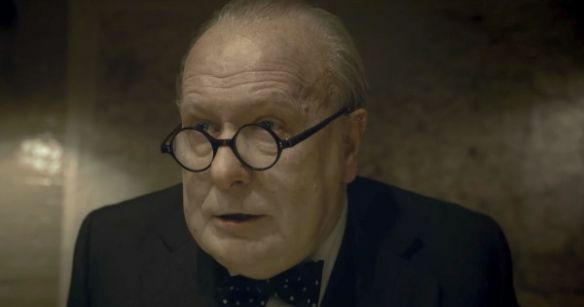 Given how woke the Academy has become, their decision to recognize, with one of its premiere awards, “Darkest Hour”, a hagiography of British war-time Prime Minister and unapologetic South Asian killer Sir Winston Churchill, is beyond reprehensible. Maybe in the 80s and the 90s, when no one cared, I would not have batted an eyelid, but now, now given the widely tomtommed sensitivity on the part of the Academy to the recognition of marginalized narratives, the fact that the Committee chose to reward a movie that airbrushes Churchill’s role in the genocide of 2 million official (some say it is close to 4 million) in India and Bangladesh, just goes to show that not all marginalized are treated equal, and that Churchill being the savior of Europe still gives his reputation the immunity from having to answer for his crimes in India. So what exactly did Churchill do? The sad thing is not many in India know this, far less those outside it. I will spare you the history lesson, but in brief, he made sure that all the food and clothes produced in Bengal got sent away to feed and clothe European soldiers during World War II (yes the same war for which “Darkest Hour” presents him as the messiah) leaving the natives to starve. If that was not bad enough, he actively prevented humanitarian aid from reaching Bengal once millions had started dying. This was as much due to his desire to scorch-earth Bengal before it fell to the Japanese (that never ultimately happened) as well as the fact that he hated brown-skinned Indians, and considered them sub-human. This is not conjecture. This is documented. There is very little, once you think about it, to distinguish Churchill and Hitler in this respect. Both suffered from intense pathological hatred of certain races, and both put into places policies whose ultimate result was mass genocide. Now imagine Hollywood recognizing a movie about Hitler that just shows him as a Bohemian artist in Austria, and just stops there. That wouldnt happen, but still, might fly because it’s not as if something is being hidden, pretty much everyone knows what Hitler did. The problem is very few know the same about Churchill. Or at the very least the guy winning the Best Actor playing Hitler would not have saluted Hitler, in the way Oldman saluted Sir Winston Churchill in his Oscar acceptance speech. I think we can all at least agree on that. Which brings me back to “Darkest Hour”. What it really is is the latest installment of the colonial project to cast Churchill, the high priest of colonialism, as a savior of freedom, the man who stood between Europe and tyranny. In order to avoid diluting the narrative, it is imperative on the part of the apologists and the standard-bearers to keep hidden the small matter of 4 million people dying through starvation so that Hitler could be fought. I would hide it too myself. After all, the “blood, toil, tears and sweat” rhetoric doesn’t sound all that inspiring once you realize that those body fluids were extracted from little children lying dead in the gutters of Calcutta, from men and women fighting with dogs for scraps of rotten food, from zombie like armies of the unfed walking the streets chanting in unison “Phyan chai” (Some water of rice please). Lest I be misunderstood, my problem isn’t in making a film on Churchill. My problem is telling only part of the story. My problem is showing Churchill as a knight in shining armor. Now I understand that a European white life was “more” than non-white Asian and African lives was a fairly common and accepted sentiment for the times, and I am not one to judge people of old by the standards of today. Charles Dickens thought pretty much the same about Indians (“I wish I were the Commander in Chief in India …. I should do my utmost to exterminate the Race upon whom the stain of the late cruelties rested … proceeding, with all convenient dispatch and merciful swiftness of execution, to blot it out of mankind and raze it off the face of the earth”). But he just thought, he was never in a position to do anything. Churchill was. That deserves mention. That truth deserves consideration in the myth that is being propagated. The counter-argument to this would be that the Oscars are recognizing excellence in cinema, and that Oldman’s performance as Churchill is what is being recognized, not Churchill per se. That I would have accepted if this was ten years ago, because the Academy was then an equal opportunities offender. Now it is not. Now the powerplayers in Hollywood and the Academy are rebranding cinema, the most impactful of all popular art forms, and with it the definition of excellence. A film is evaluated not just by the standards of acting and cinematography and all the stuff you thought you understood in film studies, but also critically by the standards of representation, justice, how well they represent narratives of the marginalized, in how they change opinion, in how they influence the creation of a so-called better world. Given that this is now the standard, and I am not getting into whether it should be, there is no excuse for ” Darkest Hour” to make the cut. It retreads the same old colonial Eurocentric narrative, anything that happens in Europe is significant, anything that happens in the other continents is not, and that lives lost elsewhere, even four million of them, in the pursuit of saving Europe, should not be considered worthy enough to sully the heroism of Sir Winston Churchill. Very nicely written Mr. Ray. Today’s America is all about being politically correct (or at least that’s what they feign). I was listening to a radio conversation today where they urged senior actors like Meryl Streep etc. to incorporate inclusion cause in their contracts ensuring the support crew has proper representations from the ‘people of color’, LGBT etc. If reservation is the way forward in today’s America to prevent discrimination; then the stakeholders of American cinema should be held accountable for painting a white supremacist (or brown hater) in a bright color. But then again, people either forget or are unaware. Nobody remembers the arrogant disrespect of the law of the Yadav supremo but humbly calls him ‘Netaji’. Nobody calls out the shameless abuse of law by the Khan but calls him bhaijaan. Left liberals never condemn the political violence unleashed by CPIM or the condition of today’s Venezuela; but acknowledge the cerebral supremacy of the left cabal in Indian society. People cry fowl on the Islamic extremism but I don’t see them shed a tear on Irish law that resulted in the death of Savitha H. Nor do they talk about the strict catholic laws in El Salvador or the conversion programs in the Southern India. Although your impeccably researched article reminded me of all these things; I am sure I would make my peace with today’s world and watch cute cat videos or Taimur’s photos by end of the day. Thank you for the extremely well written article. I have missed your commentary on such topics these last few years (since you started writing books and stopped blogging). I hope you will continue with your blogs even in the future. You have summarised everything that I was feeling after watching the oscar result in this wonderful and hardhitting post. I’ve been a big fan of your work for almost 8 years now. Came here for the lolz, but stayed for the feels. Greatbong I salute thee. Indians have only themselves to blame who have not just only, not been introduced to this aspect of that criminal,but also been glorified in the history textbooks. How much could you expect from the Academy when the popular opinion in our Nations’ mindset remains favorable to ‘Sir’ Churchill. We only have ourselves to blame for such spineless cover up of a major and a tragic part of Indian History and thereby resulting in a re-interpratation of his character and moral values. Gladwell had a podcast on how he chose not to send the aid. I don’t completely agree with your opinion Arnab. I have not seen the film yet so can’t really comment on the performance part but i think to expect the Academy to live upto the standards which are in reality need based is being naive. I have liked Gary Oldman as an actor in many movies , his last great performance i remember was in “Tinker Tailor Soldier Spy”. He is definitely an actor of sustained brilliance and I won’t be surprised if he did more than full justice to the role. However the point is ,I feel slightly better seeing Oldman get this award as many lesser actors have won it in the recent past. I have tried to keep sentiment and my appreciation for an actor’s craft separate in this. Your writing is brilliant and I found your ‘Sultan of Delhi’ quite engrossing. There is a movie about Hitler that shows him as a Bohemian artist, by the way (Max). A pretty good film too. Anyway, with regards to your criticism of the Oscars, it is very well stated and correct. I do know about the starvation caused by Churchill’s policies in Bengal, from books like Churchill’s Secret War by Madhushree Mukherjee. I also agree that some lives mean more than others, and that this has been true for hundreds of years. Some token statements at the Oscars are not going to change that. My only criticism would be to state that it is a mistake to have any expectations in the first place about the Oscars becoming an enlightened platform for the highlighting of issues. I thought that a cynic like you would have recognized that. The Oscars pretend to be about “issues” now, but the Academy has always been about doing and saying what everyone (more or less) feels is safe to say at that point of time. There is no edginess to be expected at the Oscars, not when there is an audience of a billion watching, and there are TV revenues amounting to multiple billions of dollars. The idea of Oscar night is to create a feeling in the worldwide audience that they are part of some grand new world that is changing for the better, while the status quo is maintained by the powers that be. The ground realities have not changed and are not really going to change all that much: only 3% of the movies to be released by Hollywood in 2018 will be directed by women, for instance. So, look up a site in an idle moment that lists the winners and losers for any given year; watch a nominated movie or two when you get the time, and move on with your life. Don’t expect the Oscars to reveal anything meaningful about life, or of change. Agree wholeheartedly, and you’ve said it much more eloquently than I ever could. Did you manage to watch Victoria & Abdul? It made me queasy and I couldn’t sit through it. Made me lose my awe and respect for Judi Dench. One of your best Arnab..
Well called, about selective inclusivism and a really horrible genocide. Those of us who admire the west’s sudden conscience should sit up and wonder. Don’t agree with you at all. The Academy award was given for best actor, not best movie. I confess I haven’t watched the movie, so I can’t comment on whether Gary Oldman deserved the award or not. But if the Academy liked his performance there should be no problems, should there? The award bestowed had nothing to do with Churchill’s politics or racism. Britishers prefer to overlook Churchill’s crimes. Would have been worth reading if it wasn’t from a Churchill fan site. Excellent article, the only criticism of Oldman getting the oscar is because there is an allegation (for which no case is filed) of assault against him all of 6 years ago. Hits the nail on the selectiveness of todays “politically correct” liberal media. Irony would turn in its grave. We protested outside CNN headquarters, when the Believer series, premiered with Hindu Aghoris by the Iranian Muslim Reza Aslan. The whole program was propaganda on anti-hinduism and reprehensible! This would then become narrative for our kids who grow up here, on what Hinduism is all about!! So a protest is a must. Few Indians from LA should have protested outside Oscars too!! Few bengali intellectuals too should have stood there with signs, gotten media coverage. I am not sure why HAF and other organizations didn’t jump in to do this! I see this as only way, going forth. We all need to sign and register our protest. This blog is awesome way. I already did a cut and paste and send it to a Rabbi who consideres Churchil his hero! The truth should come out. The pictures of the dying people are no different from those who died in concentration camps. They are gut-wrenching to see. For parents to have to dump the bodies of their kids into mass graves. For animals to have eaten the dead bodies because there was no one to do burial. So much blood the English have on their hands! Shame on the english and the Americans to promote Churchill! It was nothing short of “India’s forgotten holocaust”. It took Adolf Hitler and his Nazi cohorts 12 years to round up and murder 6 million Jews, but their Teutonic cousins, the British, managed to kill almost 4 million Indians in just over a year, with Prime Minister Winston Churchill cheering from the sidelines. I think movie makers should have creative license, even when it comes to real life characters. I don’t see any issue with people in the media (social or traditional) pushing back against the lionization of Churchill in the movie but the Oscar should be based on the quality of the movie and the actors and not it’s adherence to facts. I do think that you have a valid point as well about the hypocrisy of the Academy. If someone had made a movie that justified the actions of Hitler or Stalin or Mao, it’s not going to get nominated for anything. After a long time I am commenting on your post but this stuck close to my heart as I was arguing the same with my white colleagues who wanted to watch this movie or loved it. Gave them this Chruchill Horror extract from wikipedia link https://en.wikipedia.org/wiki/Bengal_famine_of_1943 explaining there was very little that separated Hitler’s animosity of Jews vs Churchill’s animosity of Indians. It’s very simple – Hindus and their historical persecutions do not matter in the west even today. However, Rohingyas – those are the darlings of the west.